Call recording on VoIP phone systems is critical because it can ensure good customer service, provide employee training, and offer liability protection. SIP Print offers a SIP-compliant VoIP recording appliance at a price point that is much lower than legacy analog or digital E1/T1 recording systems. Part of the reason is you don't have to pay for expensive Dialogic or NMS telephony hardware to interface with analog or digital trunks. Instead, SIP Print's appliances sit on the network and simply record the SIP VoIP traffic. Obviously, the cost economies of packet capture are much lower than using telephony cards. SIP Print's appliance offers true system-level call recording for many of today's leading VoIP phone systems, including Allworx 6x & Allworx 24x, Altigen, Avaya S8XXX systems (when used with Microsoft OCS), Asterisk / trixbox variants, Cisco, Microsoft OCS and UM, Mitel 3300, NEC, Nortel SCS, Shoretel, SIPXecs, Vertical, and Zultys MX-250. 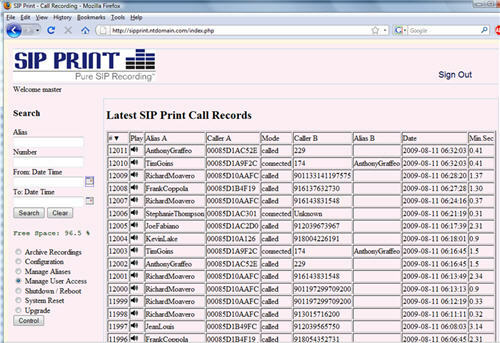 Because it supports SIP at the communications system level, SIP Print's platform can also record advanced functions like voicemail or "follow-me" calls forwarded to mobile phones or off-premise phone numbers. SIP Print sent me one of their VoIP call recording 1U rackmountable appliances for review. There are two models available - SMB and SME (higher-end). The SIP Print Enterprise (SME) is a higher-end system that has dual redundant power supplies and supports RAID. SME also has alarms for an unplugged or bad power supply, and it has an alarm for a bad or missing disk drive. SIP Print sent me their SMB model to test. Installation was a breeze. Not like the old days when I tested call recording systems from NICE Systems which required tapping into the T1 line or analog ports. All I had to do was configure port mirroring on a Gigabit switch that connects to our Asterisk-based phone system. I "mirrored" all the traffic going to/from the IP-PBX and send it to the SIP Print appliance. This way, the appliance "sees" all of the SIP traffic, including the RTP audio packets. Next, I added an additional IP address to my network card (192.168.2.50) since the appliance uses the 192.168.2.x network. I then launched my browser and went to http://192.168.2.253/, the default IP address of the appliance. I logged in with the master username and password. The first thing I did was change the network setting to match our own. 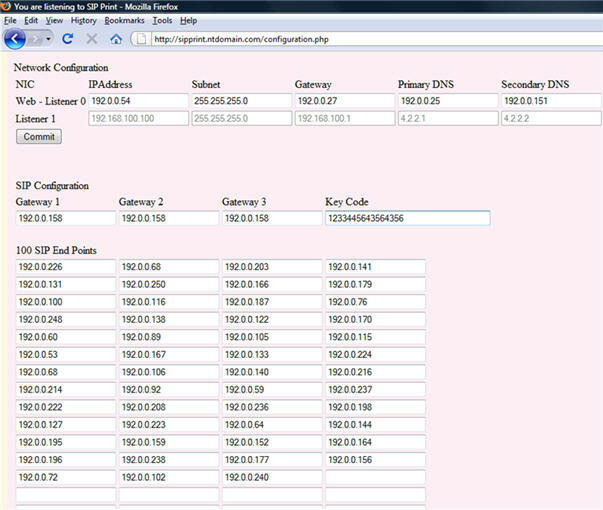 Then I added the SIP gateway (IP-PBX) and a bunch of IP addresses used by our SIP endpoints (IP phones). You can have up to 3 gateways/SIP proxies/IP-PBXs, while the SIP endpoints are licensed, so it depends how many licenses you purchase. Our configuration was licensed for 100 SIP endpoints. It was a bit of a pain to add each SIP endpoint's IP address one at a time. I wished the device had an auto-discovery mode which would automatically listen for SIP REGISTER messages, which all SIP endpoints send (usually) every 5 minutes. Would make adding the entire list of IP phones an automatic process that takes only 5 minutes. Thus, I had to copy/paste one-at-a-time each phone's IP address that belonged to our SIP phones into each of the form fields in the "100 SIP End Points" section. SIP Configuration Screen for adding SIP gateways & SIP Endpoints. The speaker icon under the 'Play' heading allows you to quickly play any recording using your favorite .wav player. Since the results are paginated, you can go page-to-page by clicking Next or Previous. Additionally, the web interface sports some powerful search capabilities. I was able to search by username (alias), phone number, and date range. The alias and phone number support partial matching, so instead of typing 'thomasjones' you could just type 'thom' and it'll match. The search was blazingly fast, which is crucial for any call recording system. As soon as I clicked search, less than a second later, it would return the results. My initial impression of the web GUI was that it was sort of ugly and simplistic. But after using the system, I appreciated its simple GUI and the ability to just get things done. In fact, another speedy feature is the ability to sort any of the column headings, including alias, date, and phone number. Once again, sorting is nearly instantaneous. Thus, finding a specific recorded call couldn't be easier both for users and managers that have access to other employee's call recordings. One minor nuisance is that you cannot reset a user's password, even if you are the 'master' administrator account. Often users forget their password, which requires a password reset. Instead, as a workaround, I simply deleted the username, re-added the user and then had to re-add the aliases they had access rights to. While the screenshot above shows a "delete" option, interestingly you cannot delete individual call recordings from the main call recording screen. I asked SIP Print about this, and they told me that allowing users to delete their individual calls caused more headache for managers, CEOs, and executives looking to keep a sharp eye on their employees interactions with customers. They cited examples where an employee claimed one thing and the customer another, but since the recording was deleted, so there was no way of determining who is at fault. Truth be known, the customer is NOT always right. In fact, they also discussed lawyer and financial offices that require 100% recording of all calls for liability purposes. A client could for instance claim they said they only wanted "100 shares of Company XYZ" but the stock broker purchased 1,000 shares. By examining the call recording, it can be determined who is right. 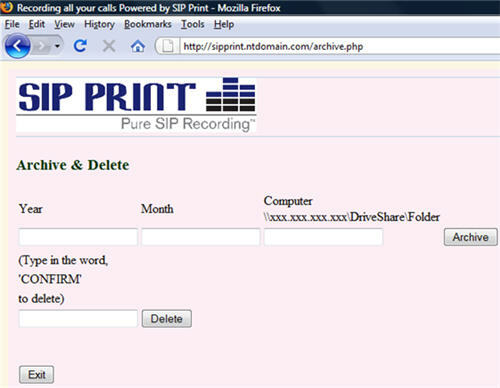 Thus, SIP Print has taken the approach of blocking the deletion of individual call recordings, but they do allow administrators to archive recordings and then delete them en masse. My next thought was "What if you don't archive anything? How much recording storage would you get before running out of space?" SIP Print told me that if you take the phone off hook you would get 5 years of recording. Impressive! The 'Enterprise' version will get you 15 years of recording. Thus, archiving doesn't have to be done on a regular basis if you don't want to. When I asked for further details on why they designed their platform to record 100% of calls, SIP Print's CTO Jonathan Fuld said, "When we set out to design SIP Print, we said, we want to make a device that records all calls all the time. We did that to differentiate our selves from a feature standpoint, because all IP PBX's and most IP Phones have a "push to record" feature already incorporated in their software/firmware/hardware." He added, "The xlite softphone allows you to click on a button to record to your desktop. Zultys allows you to record calls on an as needed basis or record all calls - but there is a limit here as with Allworx and other IP PBX's. Zultys can only record so many calls before reaching its limits. Allworx eats up voicemail space." Jonathan continued, "In an IP Telephony world, the IP PBX is a SIP proxy - a gateway - that incorporates voicemail. As you know the ip phone is now the phone and the pbx - it does it all, except recording. The network is the telephone - peer to peer. The peer to peer model distinctly changes the control of the phone call from the pbx to the phone. No more can the PBX offer "barge-in", "whisper", "monitoring" without distinct overlays of the SIP Protocol. And that is fine. It means the phone must interact according to the TDM model (for now) - control most call functions are via the PBX, because no-one has yet offered "barge-in", "whisper", "monitoring" in the peer to peer model." He went on to explain, "On the other hand, recording all calls becomes quite simple in the peer to peer model. Place SIP Print in the middle of the network stream of traffic, capture, record, obtain metadata (quasi-cdr), display and play - all quite distinct processor intensive functions which would grind most IP PBX's and IP Phones to a halt. When you and I make a phone call, it is just one conversation. If I press a couple of buttons on my phone, to record the call, the "device" (whatever it is) records just that one conversation. SIP Print records all the conversations." The prior version I was testing didn't have a web-based reboot for administrators. Thus, I had to press the reset button on the unit and it would do a graceful shutdown (though current calls won't be saved). Fortunately, they just added a web-based reboot option in v1.3+, so administrators don't have to walk to unit to reset it. I would like the phone numbers to convert to hyperlinks that point to a reverse lookup web page. That would be quite convenient to know if employees are making business calls or calling their spouses 10 times per day! One other suggestion is the ability to "share" the call recording with your customers using the web interface. While you can email the recording, often times email servers have a size limit on attachments (i.e 5 MB), so you can't use email. Of course, SIP Print would have to allow some sort of "guest" account that lets customers authenticate onto the appliance to retrieve the recording via their browser. This could open a security Pandora's box if the "guest" account lists every "shared" recording. One way around that would be to allow each SIP Print user to have a secondary username & password, which logs customers in with limited access to only the recordings that each SIP Print user shares. Of course, if the SIP Print user forgets to "unshare" the recording that could be an issue as well, since future customers that logon can see previously shared recordings. Perhaps limit it to 1 shared recording and have it auto-expire (unshare) after 5 hours? This gives enough time for the customer to retrieve the recording and then auto unshare it. The initial purchase includes the license of 20 users for SMB, 50 users for SME. The latest version adds support for handset to ITSP bypassing the IP-PBX (including remote phones), which is a nice feature to have. I really like the SIP Print appliance for several reasons. It's very affordable, it's easy to setup and maintain, finding call recordings is a breeze, and it works with just about any SIP-based platform, including Microsoft Office Communications Server 2007 R2. The SIP Print appliance does exactly what it advertises - records calls - and it does it very well, so I highly recommend this product to any organization looking to add call recording capabilities to their SIP-based communications infrastructure. I work for the Village of Rye Brook, NY. We have joined an IMA for voice and data with Westchester County. We are in the process of installing/configuring an IP phone system by Cablevision Lightpath. We need to record a few phone numbers in the police department. The problem is that they will appear on everyone's phone. This SIP Print appliance looks very good and may fit are needs. We will have less than 20 phones. Any ideas? You should look at NICE Perform NPX... It is a superior product in all respects, grows with your organizations needs, and is extremely competitively priced. NICE just released NPX into the SMB market. It is marked to replace the NICE SMB product. It is easier then SIP Print to install has all of the capabilities of SIP Print and more, and is priced for the SMB market. I believe they can are giving SIP print a run for their money in the price per benefit area and as always the features and usability stand apart in the recording industry. Defiantly review SIP print but you will go with NICE Perform Express. P.S. NICE saves the audio in a safe secure format cause it is a compliance compatible application. You should consider MiaRec VoiP call recoding solution. It is entirely software-based, there is no need to buy additional hardware. It is the first really affordable call recording solution, designed especially for SMB market. MiaRec provides rich professional functionality for less money. It takes a few minutes to install it and it is really easy to use: MiaRec has a web-based interface with powerful search and intuitive management of calls.